Ondo State Workers forcefully dragged Mr. Felix Ajibokun, the Account-General (AG), to bank to begin the process of payment of workers’ salaries on Thursday, Daily Post reports. 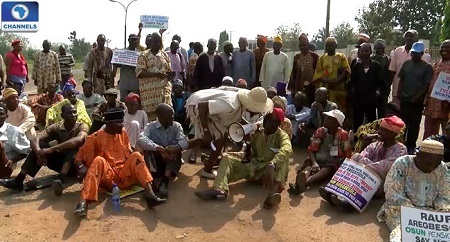 The aggrieved workers, who earlier picketed the A-G office at Alagbaka Akure, the state capital, were being owed six months salaries. They were led by their Joint Negotiating Council (JNC) Chairman, Mr. Sunday Adeleye and the State Chairman, Mrs. Bosede Daramola and other union leaders. They are begging the government for one month salary to enable them celebrate the Christmas. The state governor, Olusegun Mimiko was said to have directed the AG to pay the workers. But, Ajibokun, who is expected to retire from service tomorrow, had allegedly refused to commence the payment. Adeleye, while speaking with reporters, said the union leaders recently met Governor Olusegun Mimiko and they both resolved that the workers should be paid a month for them to have money to celebrate the Christmas. He said “about four days ago, we met with the governor and the commissioner for finance and directed the AG to pay the workers salaries so that everybody can go home with something. “Since then, we have been coming here but he has been avoiding us until today when we asked him when he will pay us but, he said no workers will be paid until after Christmas. “For your information, this is man that will be retiring from service tomorrow and the system is this, he is the only who has the legal right to pay workers and the moment he retires, it will take government up to three weeks to appointment another AG. “Let me tell, people are dying. What manner of parent are you, when you cannot buy your child a T-shirt. “We will continue to keep vigil on this premises until the AG is ready to pay the workers”. Ajibokun, however, blamed poor banking network for the reason for the delay in the payment.